This is a FUN one! A time where we get to predict how the future will pan out for our business, our market and industry in 10 years time. Hopefully we don't predict something as off-shoot as some of our favorite sci-fi movies did. 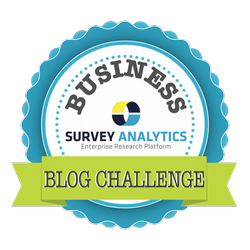 If you are just joining in, this post is part of The Survey Analytics Business Blog Challenge where we are taking on delivering 30 awesome blog posts to our readers over the course of 30 days. I had a chance to sit down with Survey Analytics CEO Andrew Jeavons and speculate the future for the software and market research industries and guess what it will be like in 10 years. In 10 years, we may not see as much change as we would think or speculate. Adaptation and validation of new methodologies do not always happen at the speed of light. Continue reading to see some of what Andrew had to say about the future. Although mobile is mainstream and personal computing will remain on the rise, the business adoption to mobile has been slow. Others are skeptical about the accuracy of the information collected. Just as in the past when the shift from telephone communication to online and e-mail took over. It's tough to swallow everything you have in place may be disrupted and changed. One of the reasons is because of the discontinuous change of mobile technology, and the large amounts of data that we are dealing with. Our efforts will continuously go into being agile and adapting to these small structural changes. Information on it's own isn't going to be good enough for someone to reach out and contact your brand anymore. You will see more and more people providing an overall brand experience and using data to personalize and guide us through each stage of the experience lifecycle. The internet has exploded as a personal connection to an open source of information. Over the next 10 years and something we have already seen happening today is the major shift as the internet is being used as an open source of taking action and purchasing goods. The same is beginning to happen for B2B, too. Using the internet to gather information and purchase goods at the touch of our fingers will continue to rise and make an impact on the commerce landscape. 57% of the consumer purchasing decision is made before they even contact you, and as Survey Analytics Vivek Bhaskaran says, 60% of the purchasing decision is feeling comfortable. Not too far off. There is no more debate of what should go online and what is better in published form. Transparency is becoming more and more important for brands. Even the most prominent print publications have shifted online and adapted to this change already. When is the last time you received a brochure, actually looked at it, and received a follow up call? You threw the brochure in the trash. Just like you marked the e-mail as SPAM. We have to learn how to be where our consumers are, and deliver something valuable and personalized. The point exactly. There is already an entire summit in New York City dedicated to this subject - "The Future of Storytelling Summit. "After a presentation, 63% of attendees remember stories. Only 5% remember statistics! Storytelling is important, and in 10 years we are going to be much better at it. We will figure out how to bring our facts to life and make an impact. The importance of data visualization is rising too, to make it easier to filter through the increasing amounts of information. American statistician Edward Tufte coined that data needs to express "complex ideas communicated with clarity, precision and efficiency." Smartphones have been coined as an extension of ourselves. Whole person data is something already happening around us today, although we may not realize it. For example, your grocery store loyalty cards have information behind them all about you. What if you buy Folgers Coffee for 2 years straight and then shift to Maxwell? They will know. But how they use this information tied to us is not yet released, it's just all speculated upon. Loyalty cards have also transitioned into being mobile driven loyalty by brands like CVS where they present coupons on the things you buy the most. In 10 years, digital wallets and mobile loyalty will be everywhere. So will passive data, which is volunteered and accurate information from consumers from their mobile devices. And we are excited to help bring that experience and how you receive information on all of this data to life with integration.